Hey Babes! We're halfway through Peach Week at the GB Studio and our booties are at least an inch perkier from all of that Super Booty 😂. If you're having trouble getting up and down off of the toilet, you're in good company. Grab some pink bath salts, get your 🍑 soaking in the tub, because we've got more booty work for you to do! Here's a NEW 26 minute Barre Booty workout for you to do at home or on vacay. GIVEAWAY TIME! Would you like to win over $300 in some of our fave beauty products including items from Urban Decay, Smashbox, Bumble & Bumble, St Tropez, It Cosmetics, Buxom, Caboodles, Tony Moly & more? Well, here's your chance...Go NOW and subscribe to our YouTube Channel, watch & like our latest video upload and leave a comment. We'll be announcing the winner on Instagram this Saturday by 12pm CST. If you'd like more videos like this, leave us a comment below and tell us what body parts you want to work next! FOLLOW GARAGE BARRE ON INSTAGRAM! The force is strong with us. Okay, we know we’ve lost a good majority of you guys with the Star Wars references here, but believe it or not, there are many connections between barre and what happened a long time ago in a galaxy far, far away, and no it does not involve lightsabers (dang it). Look at what Yoda said– while we do believe in trying (sorry Yods), sometimes you just need to do the dang thing and jump in head first. Sometimes our fitness journey feels like the hero’s journey that Luke embarks on at the beginning of A New Hope. And, as said, we definitely feel the force when our legs begin to shake like no other. So, in honor of May the Fourth Be With You, we’ve come up with some forceful FOURTH position (get it?) workouts. Pew Pew. Work those calves babe, stand facing the barre (or chair or kitchen counter) and stagger right foot in front of left, turning out your toes to 10 o'clock and 2 o'clock. Rise up onto your toes and lower down for 32 reps. Switch to left foot in front and repeat for 32 more reps. talk about 🔥🔥! Siill in your fourth position staggered stance, rise up onto your toes (we call this releve in fancy barre terms), and bend those knees down and up. Make sure your toes and knees are in alignment and that you keep your chest lifted with shoulders over hips. Plie for 16 reps and then repeat on the other side. With one hand at the barre (or kitchen counter), stagger your outside foot in front of inside foot and make sure to turn out those feet to 10 o'clock and 2 o'clock. Come up onto your toes and alternate plies front, lift leg out to side and pile in back for 16 reps. Then turn to the other direction and repeat 16 reps on the other side. Grab a slider or dishtowel and stand with your right hand at the barre or counter and place the slider or towel under your left foot. Turn toes out to 10 o'clock and 2 o'clock. Slide left foot out to the side and then slide behind you to fourth position and plie as if you're taking a curtsy. Slide out and back 16 times and then repeat on the other side. Make sure knees track with your toes. When finished with this FORCE full barre workout, celebrate by making your best Wookie sounds. May the Fourth from Lacey Garrett on Vimeo. Today, I’m here to swear off my previous swearing off of Marie Kondo's innovative method because I need it, and you need it; we all need Marie; for the athletic wear drawer. Yes, the drawer that you are currently trying to stuff 15 pairs of leggings, 20 tanks, and five million free shirts in. I know I can’t be the only one here. So let’s go over Marie Kondo’s method– barre style via Lacey. Marie Kondo says if you touch it and it doesn’t bring you joy, get rid of it. I.e., anything that is a gift that you don’t like, things that have never been worn, things that give you a bad feeling about how you appear in them, etc. GET. RID. OF. IT. Lord knows we all need a little workout drawer organizational help - or at least more space to stuff our new leggings from accidentally forgetting to skip the month on . Make sure to go thru all of your workout drawers at one time and urge from all of them. Learn how to fold, because you’ve been doing it wrong this whooole time. ☑️ If you’re folding a GB tank or shirt, lay it front side up, and spread it out with your palms. This is where you communicate with your affection to your object through your palms. If you have no affection left, just flatten out the shirt with your palms. ☑️ Then, fold each side in to about the neckline and fold the sleeves (if it has them) as one to lay over the crease, and smooth out the shirt. Fold in the other side. Fold down the top third and press smooth. ☑️ Then fold in half and press flat. Making sure that everything is nice and compressed, the shirt should be able to stand on its own. Magic! 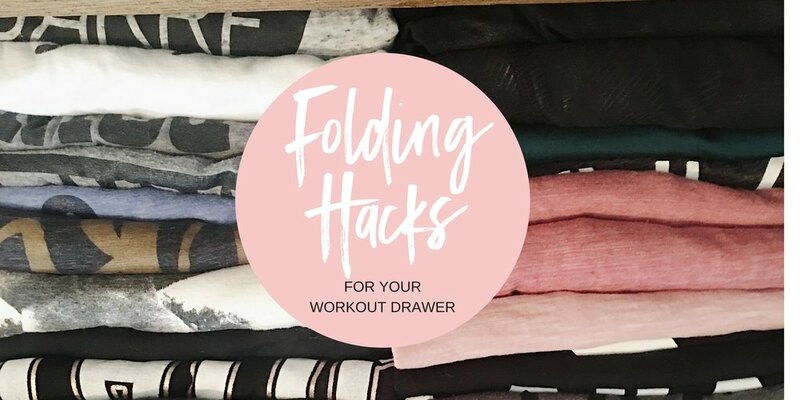 You should be able fold all of your shirts and have them stand in your drawer. This also helps when you have a specific shirt that you want to wear but can’t find it. Why are they always at the bottom of the drawer? Same idea here, babes. Check out how to make your leggings into a tiny little free standing rectangle as well with these easy steps. ☑️ Lay the leggings facedown and smooth them out. These are some go Lacey's fave from Victoria's Secret. ☑️ Fold leggings in half lengthwise. ☑️ Fold into thirds, bringing up the bottom third up first. ☑️ Fold over the top third so you have a little perfect rectangle. Now you're ready to stack into your drawers! I don’t know about y’all, but I’m actually pretty stoked about organizing my drawer. It’ll be pretty tubular. I’m going to communicate extra love to my Cali shirts. But to be real, I’m going to communicate it to my shirt that I caught a game once; the only time I exhibited true athleticism. How else do you celebrate your second year? By harkening back to the best decade ever. Even though half of us were not alive yet (but we did a good job at guessing what people wore in the 80s). How perfect are these babes, though? Our material girl dreams are coming true. And of course, LOOK at our fearless leaders. Like, really, Madonna would not have been the ish if these two girls were around. Along with more than 100 babes (plus some husbands and kids), we pulsed, plied, and did the Thriller to the Mixtape, the best 80s tribute band in town. ...And then we danced the night away to Mixtape! We're going to mark that as a successful night in our books. Tell us: what's your favorite thing about the 80s? In case you haven’t heard, Garage Barre™ is turning two today. You probably should have heard by now because we are a *little* excited. We’re so excited not just for the success we’ve had (humble brag much?) but because we’ve gotten to pulse, tone, laugh, cry, and share waaay too much information with some of the best babes around. And since I’m not a co-owner (this Kelsey coming at ya wassup wassup), I can humbly attest to the fact that Lacey and Kirby are some of the hardest workers out there. You guys don’t know all of the countless hours they’ve put into behind the scenes stuff and all of the sacrifices they’ve made. I’m pretty sure I don’t even know. Plus, the babes that they’ve brought on to lead— my fellow instructors— are some of the best, hard-working girls to carry their vision. I guess the point I’m making here is that we’re celebrating today because all of the hard work is yielding to making women truly feel great, and that’s the greatest present that we could ask for. Again, not going to make any pretense that I’m large-and-in-charge here, but I think I can speak for Kirby and Lacey when I say that every single hardship is worth it when we get told that one of our babes regained or found their confidence, belongs, or believes that they are enough. Our mission of accepting everyone regardless of budget, leggings, shape, ethnicity, or just all-around look has not strayed far from our hearts. Now it's time for me to brag on you: you’re the reason that this is possible. You’ve been the first one to introduce yourself to an unfamiliar face, or make that new babe who is taking a giant leap out of her comfort zone to come to a barre class. You’ve jammed along with us at the barre. You’ve laughed at our jokes— well, mostly you’ve looked at us, but you let us tell the joke anyways. Probably most importantly, you’ve believed in us. THANK YOU *raises imaginary glass*. Ugh I'm being hit with the feels so much that I'm about to cry at Kim Kardashian on the scale of 1 to Kim Kardashian. Spoiler alert: we may or may not dog on running.